Big news from a handful of the streaming service providers this week! Of course, the biggest news was the release of the DIRECTV NOW DVR app, which we covered earlier this week. Coming in a close second is a series of announcements from Amazon, Hulu, PlayStation Vue, Sling TV, and YouTube. Most of this news was released at the recent Pay TV Show held May 14-16 in Denver. If you use any of these streaming services, or just like to keep up on streaming, check out the latest news. Things continue to heat up in the world of streaming service providers! Amazon users who love pro football should be excited about this announcement. Amazon viewers will be able to stream Thursday Night football for free on Twitch during the 2018-2019 season. This is what Director of Amazon Channels Rich Au told Cord Cutters News at the Pay TV show in Denver. Amazon will stream Thursday Night football games without a paywall, according to Cord Cutters News. Au told Cord Cutters News that Amazon will create an interactive chat environment for its Twitch stream. This will be similar to what Twitch currently offers during game streams. If you’d like to stream Thursday Night Football games, you will need an Amazon or Twitch account to log in. Both are free to set up. Prime members can watch through their Amazon Prime Video app. This will be available around the world, except for China. Picture in Picture: This lets viewers continue to watch programming as they surf the Hulu app on their mobile devices. Viewers can also jump between programming. Stop Suggesting and Remove: This allows viewers to remove unwanted programming suggestions from their Watch History. Chromecast & iOS Support On The Go: Added HDMI support to iOS, which enhances the Chromecast device experience. With Chromecast, viewers you can use the new portrait player to control Chromecast playback on their phones. Irving set May 22, 2019 as the expected launch date for Hulu’s new features. Speaking of PlayStation Vue, the streaming service has less subscribers than DIRECTV NOW and Sling TV. This speculation was announced at the Denver Pay TV show by Joel Espelien, TDG senior analyst. Espelien said that TDG estimates PlayStation Vue subscription rate at 670,000 people. TDG estimates Sling TV numbers at 2.21 million, and DIRECTV NOW at about 1.2 million subscribers. TDG estimates the total number of streaming subscribers of any service to about 5.1 million people. Together, DIRECTV NOW, PlayStation Vue, and Sling TV serve about four million viewers. This would leave the other streaming service providers scrambling to attract roughly one million streamers. Sling TV recently announced the addition of two new networks – REVOLT and Cinémoi – to its lineup. These two unique networks add to the vast diversity of programming offered by Sling TV. Cinémoi provides a diverse selection of independent content to Sling TV. This quality programming includes vintage and modern movies, live entertainment, documentaries, and more. It also offers a lot at events such as the Cannes Film Festival and others. Sling TV is the only live OTT service to offer this channel. It’s available for $5/month to Sling Orange and Sling Blue viewers, who can find Cinémoi in the Hollywood Extra add on. REVOLT is founded by rapper Sean “P. Diddy” Combs, REVOLT offers hip-hop culture, live music performances, events, and more. Viewers are treated to the latest news from leading hip-hop artists as well as popular shows such as The Breakfast Club and more. REVOLT can be found in Sling’s Comedy Extra add-on, and its available to Sling Orange and Sling Blue viewers for $5/month. In the past, we’ve reported that the addition of local TV affiliates can drive up the costs of most streaming services. This reality was echoed by Warren Schlichting, president of Sling TV. In a speech at the Denver Pay TV Show, he said that the price of locals on traditional pay-TV services will likely cost streamers $15 per month next year. This is a $3/month increase over what customers pay this year. Over a two-year contract, this could cost viewers more than $300. Schlichting said that the rising cost of local affiliates makes a strong case for getting TV antenna. This represents a one-time purchase that continues to provide free local TV for the life of the device. He reminded the crowd that the taxpayers own the airwaves, and that local programming being broadcast shall always remain free for anyone who uses an antenna to receive them. Sling TV is optimized for use with the AirTV Player. This device uses a TV antenna to obtain most or all local channels in a given TV market. It also allows for streaming with the purchase of a Sling TV plan. All of this programming is displayed together on AirTV’s easy to use guide. YouTube is replacing YouTube Red with YouTube Premium. This gives viewers access to all YouTube originals, which includes the recent hit Cobra Kai, and a wide variety of other shows and series. YouTube Premium also provides an ad-free experience, background play, and downloads of the millions of videos on YouTube. It will cost viewers $11.99 per month. The introduction of YouTube Music Premium service is separate from YouTube Premium. As its name suggests, this is for fans of YouTube’s many music offerings. For $9.99 per month, subscribers get ad-free music, listen in the background, and downloads for $9.99 per month. YouTube Premium is expected to first be made available to viewers in the U.S., Australia, New Zealand, Mexico, and South Korea. Later, viewers in other markets that include the UK, Canada, and many other countries. That’s a Lot of Streaming News! 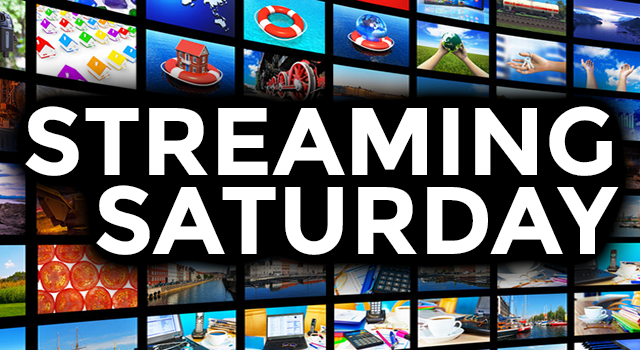 After this week’s Streaming Saturday, I realize why Stuart Sweet makes me write this column. There’s a lot going on among the streaming service providers, and he’s probably too busy beta testing this or spectrum measuring that to want to take on another column. (Note: He always sets his phaser to “stun.”) That’s too bad, because he’s missing out on a near-constant amount of innovation in a short amount of time. Or is he? In a world were “yanny” is “laurel” and vice versa, I just don’t know what to think anymore!